In Ancient Egypt animals were mummified for different purposes, not just like a sacred animals but also like votive offerings or food “victual” mummies. Mother of the sacred Apis bull. 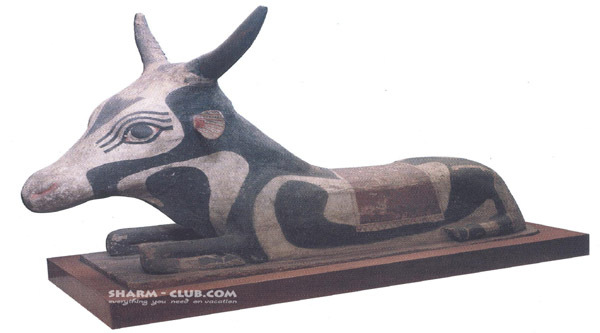 Like any other culture, the Egyptians worshipped the holy animals, whose souls lived on in the netherworld. Relationship between animals and humans extended beyond death. 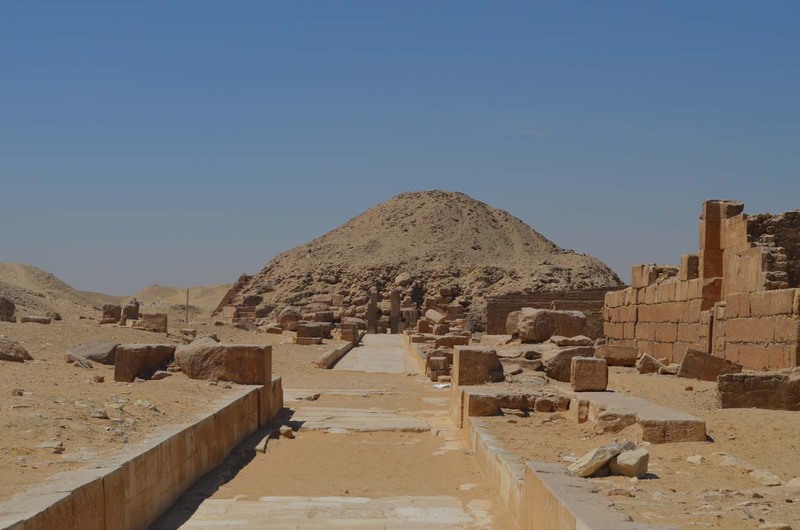 While pets were buried in the tombs of their owners, sacred animals were buried with the reverence due to gods, in their own sepulchers, like the Serapeum at Saqqara for the Apis bulls, and the Ibis galleries at Tuna el-Gebel. The holy animals were also adored in their specially built temples and graves like Kom Ombo crocodile or Kebasch for the holy cat. The holy animals : bull, crocodile, cats, falcons, scarabs, ibises and so on were also mummified. Mummified animals have been kept in Cairo Egyptian museum since its inception, in a special room, Room of Flora and Fauna. At the beginning of 21st century a new project was launched to renovate the room and as a result The Animal Mummy project appeared. 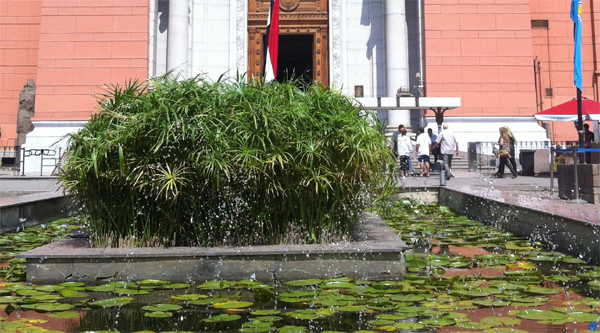 Now the Egyptian museum has a new modern display of animal mummies. The museum possesses one of the world’s first and largest collection of animal mummies. In 1902 the museum became one of the 1st art/archeology museums to include a display of the ancient Egyptian’s natural world, with a focus on animal mummies. In the early days of archeology many samples from all these categories were regarded as mere curiosities, often ignored or even thrown away after excavation. Gradually the importance of animal mummies was recognized and examples were collected and kept in the museums. Pet mummies are the most understandable type of mummy from ancient Egypt. The Egyptians kept pets from the earliest times. Pets were so beloved that the Egyptians wanted them to have eternal life, so they mummified and buried them. Food, or “victual”, mummies are an unusual genre of mummy and consist of poultry or joints of meat that were wrapped in bandages and placed in tombs to provide food for the Afterlife. All the choice cuts can be found in tombs. Most of these bandages meats were placed in individual sycamore-wood “coffinets” which were often shaped to the form and dimensions of meat, though others were placed in reed baskets. The meat and poultry were prepared as if they were ready to be cooked. Some of the mummies are even coloured brown to give them a roasted appearance. Sacred animal mummies are of animals that were worshiped during their lifetimes as a personification of a god, and buried with pomp and circumstance upon their deaths. The ancient Egyptians believed that the spirit of the god would enter the body of a specially marked beast, and upon the animal’s death would move to another animal which also had special markings like a scarab shaped mark on its tongue or a triangle on its forehead for example. Priests would search for this new sacred animal: once located, it would be taken to a temple. These animals would have commanded the same respect or even more as that afforded to a pharaoh. The Apis, Mnevis and Buchis bulls, the Sobek crocodiles of Kom Ombo and Fayum, and the Rams of Elephantine and Mendes are examples of such beasts. Now at Kom Ombo a new museum devoted to crocodiles and its mummies can be visited to get an idea about crocodile worship rituals in the area. Votive offerings are mummified animals that were dedicated to specific deities and buried in catacombs attached to temples. This would have acted in the same way as votive candles: as long as they existed they activated a prayer. Pilgrims would purchase a mummy according to their budget, and say a prayer when it was offered to the god, prior to its burial in an underground labyrinthine tomb. Examples of such mummies are cats, which were offered to the cat-headed divinity Bastet (the goddess of love), and ibises that were dedicated to Thoth, the god of wisdom. Animal mummies were produced in much the same way as human mummies, with some variations. Mummification is achieved by desiccating the body in order to prevent rotting due to bacterial proliferation. The most standard method of mummification was to eviscerate the animal from either a cut in its left side or along its belly. In most cases the viscera of animals, unlike that of humans, which were kept and mummified separately, were thrown out. Exceptions to this were the viscera of poultry victual mummies that were returned to the body, and the viscera of the sacred Mnevis Bull, which were placed in canopic jars. After the body was emptied of its viscera, it was washed, and then desiccated using natron (a combination of baking soda and salt.) Some of the sacred animals were mummified in an unusual way. The Buchis Bull and his mother were mummified using a turpentine enema. The enemas were found during the course of excavation at the Bucheum at Armant. Unlike pets and sacred animals, votive mummies were often deliberately bred in captivity and killed. Many cats have snapped vertebrae as their necks were broken prior to mummification, while others, found in the Budasteion at Saqqara, showed damaged skulls; small crocodiles might have had their nostrils slit. 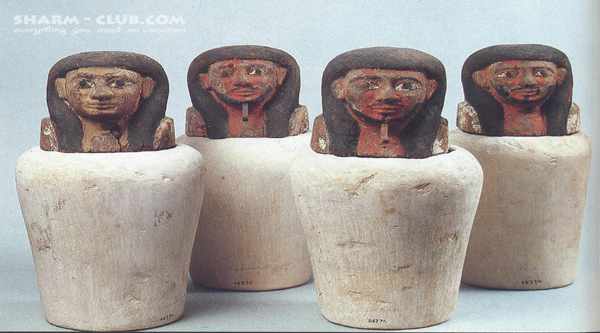 A number of votive mummies appear to be fakes. Some mummy bundles that are wrapped to look like mummies (cat, dog, hawk etc) are actually empty or contain fragments of bone, lumps of mud, or chunks of resin. Perhaps these fakes were manufactured by priests when there were not enough animals to offer. Eight million dog mummies were uncovered at the dog catacomb in Saqqara in January 2013. Saqqara dog catacomb was first discovered in 1897 when well-known French Egyptologist Jacques De Morgan published his Carte of Memphite necropolis, with his map showing that there are two dog catacombs in the area. During routine excavations at the dog catacomb in Saqqara necropolis, an excavation team has uncovered almost 8 million animal mummies at the burial site. Studies on their bones revealed that those dogs are from different breeds but not accurately identified yet. Studies on the mummies revealed that some of them were old while the majority were buried hours after their birth. The mummified animals were not limited to canines but there are cat and mongoose remains in the deposit. Animal mummies found in Abydos shine light on religious rituals of ancient Egyptians. A team of archaeologists from Toronto University has discovered a cache of animal mummies that reveal rituals carried out by ancient Egyptians for their god Osiris. 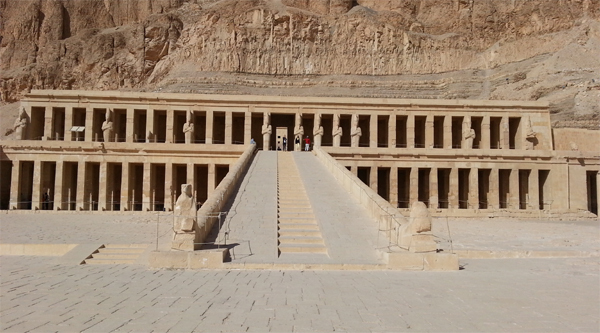 The team discovered the remains of three hall temples from the reign of King Seti I. One of them was filled with 83 mummified dogs, cats, sheep and goats over 2000-years-old. Early ancient Egyptians buried their kings at the northern side of the Upper Egyptian town of Abydos because it was considered holy land. The god of the afterlife, Osiris, was buried there after being killed by his son Set, the god of the underworld. According to ancient Egyptian myth, his wife, the goddess Isis, reassembled his body and brought him back to life at Abydos and delivered their son Horus who killed his uncle Set. Osiris and his family were buried in Abydos where a huge temple dedicated to him was constructed as well as several chapels built by different ancient Egyptian kings. Team leader believes the animal cache was created in a later period than the temple and these animals were offerings for the god Osiris. The dog mummies could represent Wepwawet the ancient Egyptian jackal god who precedes Osiris.